Arcades here presents quite the dilemma for Commander players: do the Wall tribal decks, or even just toughness-matters decks, use him or Doran as their general? Doran is good in 1v1 constructed formats because he has efficient stats anyway, and doesn’t need a deck specifically built for him to be good. He was played in Extended and Modern, even in decks where he would make 2/1 creatures like Eternal Witness less potent, just because it was so hard for opponents to deal with him. Arcades is more defensive and explicitly defines a defender-matters deck; he blocks well but doesn’t attack as well as Doran, and while creatures like Sunweb or Wall of Denial are a lot less fair when they’re able to attack, such a deck looks a lot less impressive when he’s not on the table. I think the answer is that Doran is good for duel formats, and Arcades is the guy for the Wall tribal EDH decks – it’s the one format where he keeps on coming no matter what, and the Walls can still attack even if he’s enchanted by Faith’s Fetters. Defender.dec just got a new general. Or an excuse to shift to blue; Doran was cool, but dragons are cooler. Arcades is very much the “build around me” member of the Elder Dragon cycle, rewarding you for playing a lot of defender-based creatures. 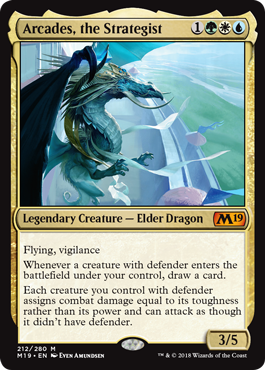 While this excludes the potent Vent Sentinel in EDH (unless Arcades is part of the 99), making all your defenders cantrip and letting them attack is a potent pair of abilities. And, of course, they do damage based on their toughness, because the best measure of a wall is how thick it is, making them usually more lethal on defense than average and able to bash opponents’ faces in. While Nicol Bolas and Chromium are the two most likely to make constructed waves, Arcades is far more fun and subtle in how he wants to play out. And a 3/5 for 4 with flying and vigilance is serviceable enough, if nothing else!